The award winning EcoTech Centre is a project dedicated to the promotion of sustainable development and environmental issues. Our role as architect and partner stemmed from an initial concept inspired by experience at the Centre for Alternative Technology in Wales and association with LRZ, a consultancy company specialising in biomass energy systems. The project includes a £2m visitor centre demonstrating the principles of sustainable development, which was completed in 1998. There is a strong education and training element backed by the involvement of the University of East Anglia as well as several local colleges and schools. There are also strong links with the development of the adjacent business park where we have also completed several buildings. A key feature of the site is one of the UK’s largest single wind turbines with the nacelle designed by Sir Norman Foster. The main building is timber framed and includes a variety of sustainable design features. All of the construction materials were selected on the basis of their environmental credentials as well as the usual functional and aesthetic requirements. The building is a passive solar design with a large glazed atrium helping to supplement the heating system as well as providing a dramatic space that functions as the main circulation and display area. Automatic blinds in combination with the natural ventilation system help avoid summertime overheating. The form of the building has been inspired by the functional requirements of the energy and ventilation strategy. The central spine is a key component in this, helping to draw cool air through the building. 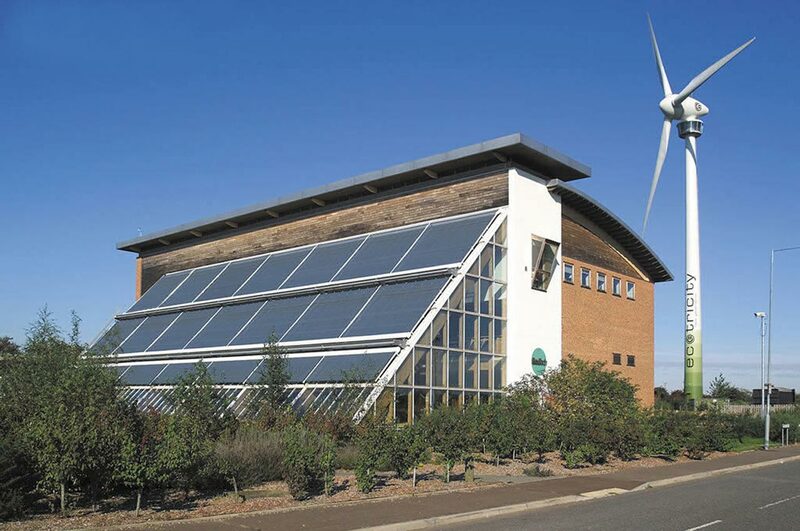 High levels of insulation and innovative technology help improve the overall energy performance which in combination with the sites renewable generating capacity makes this a truly sustainable commercial building.